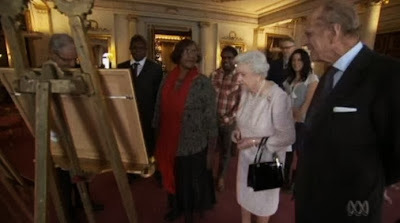 The Queen and the Duke of Edinburgh met with the family of artist Albert Namatjira at Buckingham Palace. The Queen also received the High Commissioner for Malta in London and the Ambassador from the United States of America for audiences. Click above for an article, pictures, and video from ABC. Interesting - one of the longer three strand pearl necklaces, for a change. In other current event news...an investiture was held on Friday, the 22nd, though it was hard to see the brooch as usual.